A collectible toys auction of more than 100 pinball machines will take place on March 29 as part of the Texas Pinball Festival in Frisco, Tex. 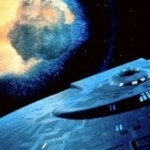 The lots include machines based on various Hollywood hits and celebrities. They would make the perfect addition to any game room, adding a retro air that harkens back to the pre-home video game days of the past. 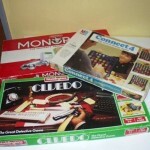 iCollector has made it easy for collectors to acquire pinball machines of their very own. 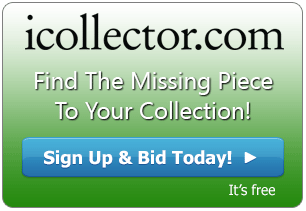 Each of the lots available at the live auction are listed on the iCollector website, where enthusiasts can browse the diverse selection and place bids on their favorites, all from the comfort and ease of their home computer. The modern, coin-operated pinball machine is the descendant of the Bagatelle tables first developed in France during the 19th century. The early tables were more of pinball/pool hybrids that challenged players to use cue sticks to hit a ball around nails and pins and into a pocket. In the 1930s, many developments in electricity led to what is recognized as a modern pinball machine. The Great Depression created a huge demand for low-cost entertainment, and the newly developed pinball machine was the perfect solution. 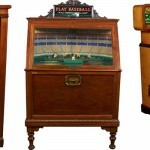 The increase in popularity drove developments such as electronic scoreboards, tilt and slam mechanisms that ended the game if the machine was being unfairly manipulated, electronic sounds such as bells and chimes and disc and coil bumpers. However, it wasn't until 1947 with the release of the Humpty Dumpty machine that flippers were introduced. 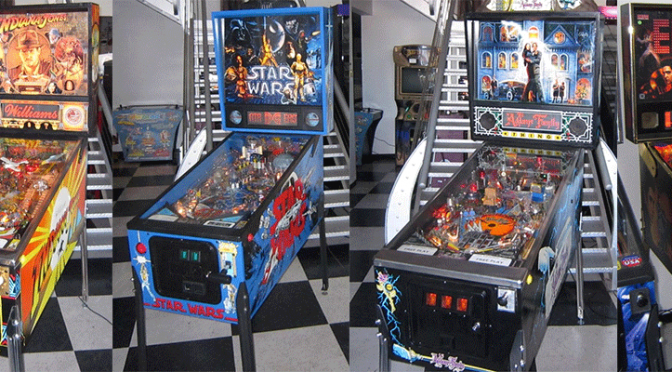 The 10 year period that followed is widely regarded as the golden age of pinball. This was despite a nationwide push to outlaw pinball machines, as they were seen as a form of gambling. Gambling at the time was illegal in the United States outside of Las Vegas. The ban took hold in many major cities including New York, where police would raid arcades, smash the machines with a sledgehammer and throw the debris into the river. It wouldn't be until the mid 70s that this ban was lifted. Getting a pinball machine of your very own has never been easier. This auction includes machines based on popular movies such as "Batman Forever" (lot #2), "Pirates of the Caribbean" (lot #22) and "Indiana Jones" (lot #37). There is also a famous Addams Family pinball machine (lot #3), which is the highest-selling machine of all time, and an exceptionally rare Varkon machine (lot #75) that was revolutionary in its use of two playing fields. Check out all the machines on iCollector.com.